First things first...the biggest match of the weekend for Irish rugby is clearly the Women’s Six Nations decider at Donnybrook Friday night. I’d love to be able to give them the same coverage as I do the men but unfortunately I don’t have the time...as much as I love the sport there are only so many hours in a given weekend! I will be watching and cheering on the girls from home tonight as a fan as I have all their matches...at least we have can live broadcasts of their matches in this campaign. I wish them all the best, as I do the Under 20s and the club selection. The legends must not be forgotten either of course! But on to Saturday evening...no doubt it has been a disappointing campaign for the senior Irish team. We thought it very possible that it would also be a Grand Slam decider for us - some very poor displays in Edinburgh and Cardiff put paid to that. Now we are technically in the same boat as Wales were last Friday - keen not to shop a third defeat of the tournament before our own supporters. Thing is though, our opposition are very different to that which the Welsh faced. This England team is operating at maximum levels of confidence...a world record equalling winning streak will do that. And what’s more, with Billy V back in their lineup, they are close to fielding their ideal selection...finding a way to get Itoje back into the second row would probably finish the job. So the question remains simple...can Ireland step up and be spoilers? Of course we can. Look - Joe Schmidt & his coaching staff set themselves up for criticism and they have rightly received it. To be fair though, I’m not sure all of it from Irish fans & commentators has been constructive. Personally I don’t think it’s that our gameplan is wrong, it’s more that if we get knocked off it, we are too slow to adjust. This match is somewhat different. Now it is up to us to act as disruptors, and in many ways Conor O’Shea showed us the way. Of course I don’t think we should play silly beggars around the breakdown just as Italy did, but what we must not do is try to impose our traditional style of play and expect it to work. Before even looking at the selection, my minimum expectation for our performance will be that we do everything we can to knock our visitors off their stride in the opening half hour...and from then, we need all 23 players focused and on top of their game for the 80 minutes - if any starters don’t comply, they need to be replaced. Now to the personnel...naturally the loss of Conor Murray is a major blow, and would be to any side. I just hope Kieran Marmion is allowed to play his own game and not try to replicate Murray’s. I expect less box kicking and more sniping around the fringes...he can definitely do a job for us, and has a similar player in Luke McGrath backing him up. 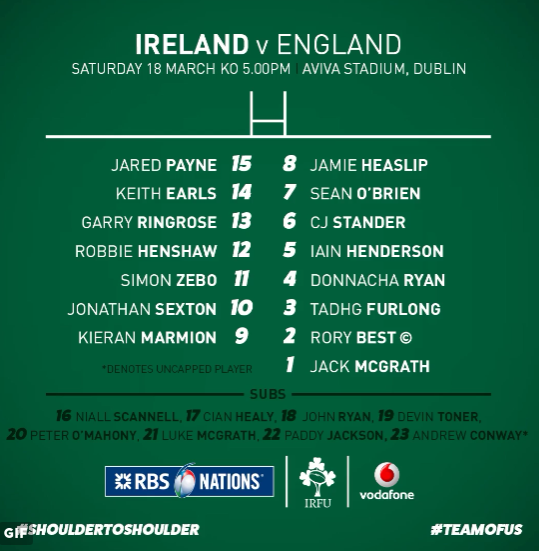 Jared Payne at full back will give those calling for Rob Kearney’s international retirement plenty to talk about. It is certainly the more natural position for him but I’m nowhere near as critical of his use at 13 as many seem to be. Joe put a lot of thought into the role of centres in his side and for the most part it has worked well. But there can be no doubt that Henshaw and RIngrose look set to be the long term duo for Ireland. But by far and away the most curious selection in this side has been the omission of Devin Toner from the starting XV. It certainly doesn’t look like one that seeks to fix the lineout woes from Cardiff! Especially when Peter O’Mahony has also been left out. All I can take from that is we’re not aiming to prioritize mauling & power plays? We’ll have to see. 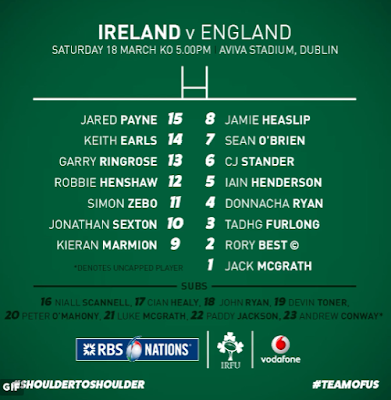 Once again we have gone for a back row of Stander, O’Brien and Heaslip. None of them made too much traction against the Welsh trio and they face a similar level of physicality this time around. Whatever about their collective carrying abilities, it is in the more traditional roles of protecting their outhalf and being hungry around the breakdown where they will need to shine. Getting in George Ford’s face a lot wouldn’t hurt either (well, possibly him). Each of them is well able for the task. When it comes to our bench, it’s great to see Andrew Conway finally get a chance for a cap, and it’s also ironic that it comes on a weekend when Blackrock College play in a Leinster Schools Cup final. He was part of the same team as Jordi Murphy & Brendan Macken that won on St Patrick's Day in 2009 and he was tipped for a green jersey a lot sooner. After many disappointments he has done extremely well to play his way back. Can we make anything of Andy Farrell being in charge of a team that’s keen to stop his own son in his tracks? Simple answer is no. They’re professionals. It’s barely worth a paragraph this short IMO. After last weekend, many fans fear an absolute mauling by the English. This Six Nations championship hasn’t exactly gone like that though. Teams have rarely carried form, be it good or bad, from one match to the next, not even Eddie Jones’ men. I think the bookies are probably right being cautious going for a narrow four-point win for the visitors, but I’m back us to put our disappointment behind us and prevail, though not without a few nervous moments towards the end - I’d say a 1-3 point margin.